Bike North’s annual Easter cycle festival will be held again in Cowra from April 19 to April 22 and will include rides each day suitable for every level of rider. As has been the case in every other year in Cowra, the ‘Bike North cyclist HQ’ for participants will be the Cowra Van Park. Of course you must arrange your own accommodation and can choose to stay in the Cowra Van Park, (tell them you are with Bike North when you book your spot), or somewhere else. 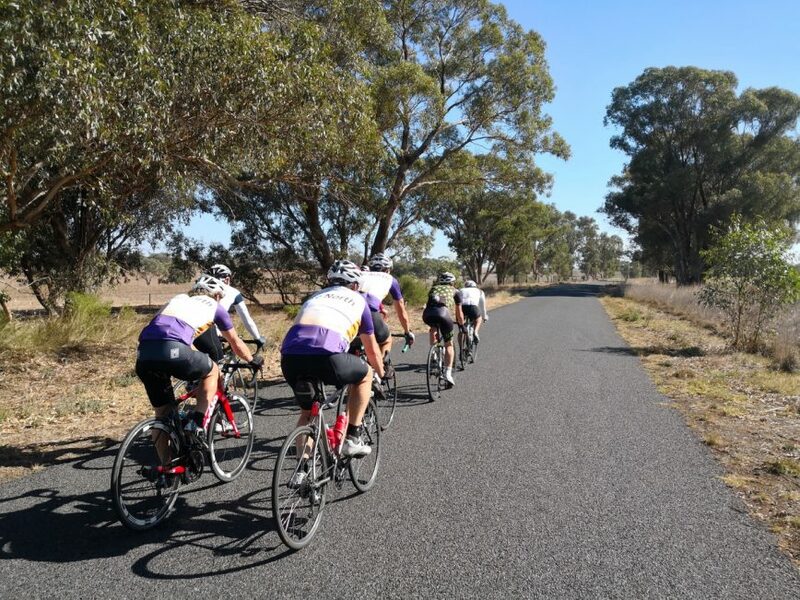 Tour de Cowra is open to all bike riders and not just Bike North members. You are responsible for organising your own transport to and from Cowra, your accommodation, and food. There are 2 major brand supermarkets in the centre of town, several restaurants, a couple of clubs and a few pubs with bistros. Be aware that shopping and eating out options are limited on Good Friday. There are several Motels, Hotels, and 2 caravan parks suitable for accommodation. The Cowra Van Park is close and handy to the ride launch point (and where we set up camp HQ); whereas the Cowra Holiday Park is a couple of km’s outside of town. All rides will start and finish at the Rose Garden Cafe/Visitor Centre. Rides will have no leader or sweep so you therefore need to be self sufficient in that you take sufficient supplies for the ride, a mobile phone, can repair punctures and make minor mechanical adjustments. You can ride at your own pace, but please do not ride alone. You MUST sign on for each ride, and sign off on your return. If anyone is not back in a reasonable time, a vehicle will be sent out on the route to make sure all is OK.
We always set up the Bike North gazebo in the Cowra Van Park, with a table, an urn and coffee/tea milk biscuits etc for you to use at any time. We will even have an outdoor heater in case the evenings get a little chilly. Bring your favourite mug and a chair as this tends to be a hub for apres ride chit-chat. All welcome! There is no bike shop in Cowra. Bring lots of spare tubes, perhaps even a spare tyre and make sure your bike has been recently serviced. A puncture repair kit and a good pump are essentials as are two (or more) water bottles, sun screen, and snacks for the longer rides. We have rarely had rain at Easter but it does happen, and the mornings and evenings can be quite cool at this time of year. Days tend to be warm to hot, but it is advisable to have cycle clothing suitable for warmer and cooler conditions. There is plenty to do in and around Cowra during the mornings when we will all be out riding; see Tourist Info. You MUST register to ride in Tour de Cowra. Registration costs $11 per person for Bike North Members and $16 per person for non-members. Once you have registered and paid you will be sent an email acknowledging this. The acknowledgement email is sent when the treasurer matches your bank deposit, so please be patient and please make sure to follow all instructions carefully. Registration covers the costs of snacks and drinks at the Camp HQ, as well as bananas and muesli bars for each ride. Updates will be emailed to participants as new and important information comes to hand. There is a registration link on this page when registration is open. If you do not see a registration link then you are either too early or too late. Try contacting one of the organisers at events@bikenorth.org.au if you need help. When registering you are given a registration code. This is to be used when making the payment as described below. Customer reference*:insert your Tour de Cowra Registration code(s) here. If paying for more than one person, please make individual payments with the relevant reference numbers; it makes it much easier to track who has paid. The registration fee is not refundable if you decide to withdraw from the event.